As you know, we love Nick and Teenage Mutant Ninja Turtles and TMNT: Return to NYC is no exception to this rule. The run time of this one disc is 157 minutes from season 3 and kept my boys interested in a recent 2 hour long road trip. Vision Quest–Leo takes the Turtles to train in the woods in an advanced ninja ritual where they must overcome their weaknesses and face their greatest enemies in order to become true ninjas. 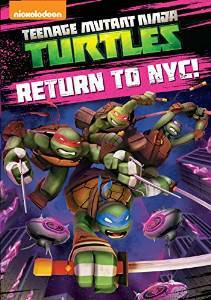 Return to New York–The Turtles return to the city to search for Splinter, only to find that the city is overrun with Kraang. Serpent Hunt–As the Turtles search for Karai, they have to deal with a city filled with Kraangdroids as well as Zeck and Steranko, who hunt Karai for their own means. The Pig and the Rhino–Donnie finishes a new batch of retro-mutagen, hoping to save Karai, but the Turtles find themselves hunted by Shredder’s new vengeful henchmen, Bebop and Rocksteady. Battle for New York – Part 2–While the Mighty Mutanimals lay siege to TCRI, the Turtles must brave the bizarre world of Dimension X to save the enslaved people of New York. Casey Jones vs. the Underworld–Casey Jones thinks he can take on the criminal underworld on his own, but when he discovers the Shredder is behind the growing crime wave, he finds himself in over his head. This action packed DVD makes a great addition to any Teenage Mutant Ninja Turtle lovers collection of DVDs to watch over and over again! My boys are happy with the disc and it makes me feel nostalgic every time I watch it because I loved TMNT too when I was a child. My son loved the turtles when he was young. He used to go around acting like them. His older sister often had to step in and keep him from getting into trouble because of it. My husband has such fond memories of the ninja turtles. I am a little older than my hubby so it doesn't hold fond memories of childhood for me.....but it's still cool. Thank you so much..I wondered and now i can take the grandkids ..or get something so they can just come over and watch.